Argentina’s President Cristina Fernandez de Kirchner (L) waves next to her Mexican counterpart Felipe Calderon before the inauguration of Latin American leaders summit in Cancun February 22, 2010. Credit: REUTERS/Daniel Aguilar. Image may be subject to copyright. Latin American and Caribbean leaders at the Cancun Summit in Mexico have unanimously backed Argentine claim over the Falkland Islands, condemning oil drilling operations by a British company. Desire Petroleum, a UK firm, began drilling for oil off the Falkland Islands yesterday despite strong objection by Argentina. Argentine President Cristina Fernández de Kirchner had earlier ruled out any possibility of military action, saying that her country would pursue talks at the UN, and negotiate sovereignty with the UK. The Argentine foreign minister is scheduled to to meet with the UN Secretary General in New York to pursue the diplomatic line. Their statement has reportedly urged the two governments to “renew negotiations in order to find in the shortest time possible a just, peaceful and definitive solution to the dispute. Meanwhile, the 32 leaders of the Rio Group and the Caribbean Community (Caricom) agreed in Mexico to set up a new regional bloc without the US and Canada, an alternative to the Organization of American States (OAS), which has been the dominant forum for the Americas’ affairs in the past 50 years. The OAS has often been criticized, However, for promoting US interests. The two-day regional summit, which ended February 23, was hosted by Mexico in the beach resort of Cancun. “[The proposed new bloc] must as a priority push for regional integration… and promote the regional agenda in global meetings”, Mexican President Felipe Calderon. Venezuela supports the proposal because it enables Latin America to move away from the US “colonizing” of the region. “This should not be an effort that would replace the OAS, ” A US State Department official, Arturo Valenzuela, said. “It’s very important that we don’t try to replace the OAS [because] the OAS is a permanent organization that has its own functions.” Chile’s President-elect Sebastian Pinera said. We propose that the new organization begin operating in July 2011, Bolivian President Evo Morales said. 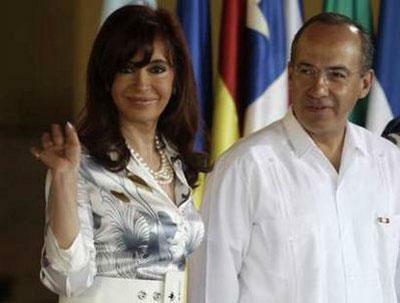 Argentine President Cristina Fernández de Kirchner said she was “very happy” with her achievements at the Summit. Britain and Argentina Headed Toward Another War? This entry was posted on February 24, 2010 at 7:18 am	and is filed under Argentina, Brazil, England, Falkland Islands, Mexico, OAS. Tagged: Bolivia, Cancun Summit, Caribbean countries, Chile, Cristina Fernandez de Kirchner, Felipe Calderon, Las Malvinas, Latin America, Lula da Silva, Venezuela. You can follow any responses to this entry through the RSS 2.0 feed. You can leave a response, or trackback from your own site.